There’s nothing better than drinking tall glasses of iced tea on a hot summer’s day. Get a small dose of caffeine in a tall glass just for yourself or make up a large pitcher for a gathering of friends and family. It’s easy to make it at home and doesn’t cost a bomb, but our best iced tea maker reviews should help you choose one that it just right for your needs and budget. Iced tea makers are simple to use. Some are similar to drip coffee maker, except that you use loose leaf tea or tea bags and the pitcher may be larger to accommodate ice along with the brewed tea. Depending on how much control you want over brew strength, you may get to select your preferred level and if you don’t want to wait around for brewing to be done, you can choose a model that shuts off automatically at the end. The more automated the machine is the more expensive, but sometimes one that requires more intervention from you will give you the best tasting tea. Now, if you like to drink both hot and cold tea and don’t want to keep two tea makers, you can get a large capacity tea maker that can handle loose leaf tea or even a regular tea making machine and then pour the hot brewed tea into another pitcher that is already half filled with ice. This takes more work but it does save you some space in the kitchen. With those points in mind, read on to see what our best picks are or go straight to Amazon to browse or shop for the top rated ones on your own. Although not an automatic, it comes close, and for basic ease in making iced or non-iced tea or coffee, the Hamilton Beach 40912R Iced Coffee and Tea maker will give you a solid brew with very little effort. It’s about as easy to use as a drip coffee maker. First, fill the carafe with ice, fit a regular coffee filter in the basket and then fill the filter with tea leaves or coffee grounds. You can leave the filter off if using tea bags. Pour water in the reservoir at the top, and turn it on. The water will heat up and drip through the tea leaves onto the ice below. You’ll get virtually instant iced tea with this method, and when the brewing is done, remove the reservoir, put the cover on the decorative pitcher and serve or store it in your fridge. The carafe holds 2 quarts of tea and the adjustable basket allows you to brew your tea or coffee as strong as you want it. The wide base keeps the carafe upright, even with the heavy water reservoir perched on top, although this means that it takes up extra space in the fridge, but since it is just enough to make tea for 2-3 people, it’s unlikely that that is a big issue. Since there is no auto shut-off, you’ll have to monitor the process, but for most people who love brewing their own iced tea or iced coffee, that won’t be a problem. 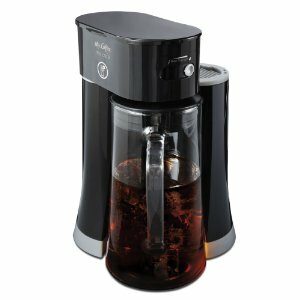 If you want a uniquely designed unit, consider the Takeya Flash Chill Iced Tea Maker. This 2 quart large pitcher has a long brewing filter that reaches almost to the bottom of the pitcher and there are no electric components to worry about. You pour hot water from a tea kettle about halfway into the jar, then fill the filter basket with tea leaves or bags, insert the basket into the hot water and close the top to let the leaves brew. The longer you allow the tea leaves to steep, the stronger the brew will be. When you are done steeping, you pull out the filter and pour ice directly into the pitcher and shake, which immediately chills the hot tea. That’s what “flash chill” is all about. Ideally, you’ll want to make a strong pitcher of tea so that when the ice is poured on top of it, the tea will dilute to your perfect strength. It may take a bit of trial and error before you get the timing right, but once you figure it out, you’ll find that this is one of the best iced tea makers around. This is a tall BPA free pitcher, so you need an extra tall space in your fridge to store it but you can also keep it on its side without fear of it leaking since the lid screws on tight. You can also buy the optional fruit infuser that has bigger holes if you want to make fruit flavored water as well. For an unrivaled ease and simplicity at a price that can’t be beat, check out the Mr. Coffee 3-Quart Fresh Iced Tea Maker. It has an auto shut-off and a brew strength regulator for a mild to strong brew, so all you have to do is pour the water in, turn it on and that’s it. This iced tea brewing machine does the rest. The 3 quart pitcher needs to be filled with ice first, if you want iced tea. Then put in the filter basket with tea bags or loose tea and filter paper and merely slide the tea maker on top of the pitcher so that the brewed tea dribbles down over the ice. That gives you virtually instant iced tea in about 9 minutes, which is one of the fastest units here. You can add fruits, spices or herbs to the tea and produce many types of flavors that will keep your taste buds satisfied every time you brew up a batch. Make sure that the pitcher is completely locked next to the tea maker, otherwise it might leak. You should also keep the pitcher locked in until all the water has drained. If you are familiar with automatic drip coffee makers, and want an iced tea maker that works in a similar fashion, then the West Bend Iced Tea Maker is a solid choice. If you know how to make coffee, you won’t have any problem with this unit. Simply pour water in the reservoir, fill the brewing basket with tea, set your preferred brewing time and steep strength and turn it on. For instant iced tea, fill the pitcher with ice and let the tea drip over it as it comes out of the brewing basket. There is a sweetener chamber that you can remove if you don’t want to add any sweetener to your drink. It’s a very simple and sound design in use for making coffee, and it will also make wonderful tea using the same principles. It comes with a 2.75 quart plastic pitcher and has an auto shut-off feature when the brewing cycle is complete. This tea maker comes with two different baskets for tea bags or loose leaf teas and there is no need to buy filters for it. One word of caution. The company will not confirm nor deny that this unit is BPA free. Granted, children under 3 would be most affected, but since it would be rare that an infant would be drinking tea, this probably isn’t an issue. But if you are looking for a similar product that uses a glass pitcher, check out the next entry on this list. From the maker of some of the finest coffee makers comes the Mr. Coffee Tea Cafe Iced Tea Maker. This electric iced tea maker mimics exactly how a cup of coffee is made, and by doing so it produces some very fine drinking tea. As with all drip coffee makers, fill the brewing basket with leaves, pour your water into the holding reservoir and turn it on after selecting your brew strength. For instant iced tea, merely fill the glass pitcher with ice and allow the tea to drip over the top of the ice in the pitcher. The auto shut-off switch turns the cycle off when it’s done and the pitcher holds 2.5 quarts. Although there is no manufacturer statement saying that the plastic, on this unit, is BPA free, the glass pitcher certainly is, and if you are worried about BPA contamination when drinking tea out of a pitcher, this would be the best choice here. Since it is made of glass, you have to be careful about how you use it. Be gentle when adding ice and give it a little time for the glass to cool before starting the brewing process. This ensures that the hot tea and cold ice together don’t suddenly shock and crack the glass.